On Monday, June 25th Lieutenant Commander (Ret) Paul Nix, President of the National Naval Officers Association (NNOA) Jacksonville Chapter presented FLAJAX Club President and NNOA member James Andrews and members with a plaque as a token of appreciation for supporting the NNOA’s Annual Scholarship Drive. The NNOA Jacksonville Chapter raised and donated $10,000 in scholarship funds to local high school seniors in 2018. NNOA is committed to the personal and professional development of sea service officers as well as improving relations and educational opportunities for students in the local community. NNOA Jax raises funds each year through their scholarship golf tournament to provide educational opportunities for local high school seniors. 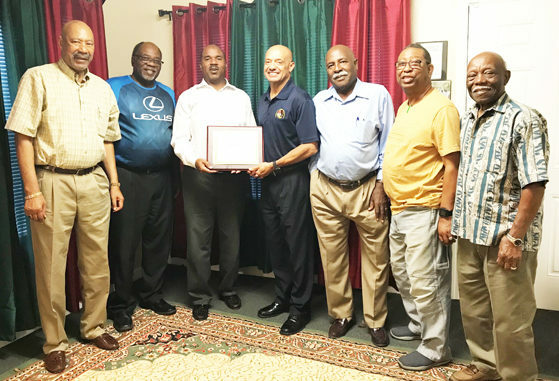 The organization has raised and donated over $80,000 to local students in recent years. 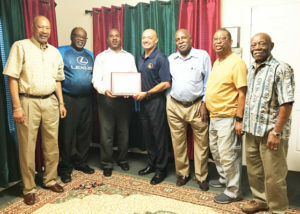 Members pictured in the photo (L to R) Robert Porter, LTCOL(Ret), Edgar Mathis, Sr., James Andrews, LCDR(Ret), Paul Nix, George Barnes, Jean Downing, Jr., and Edward Robinson, Jr.